There’s more to life than hair, but its a good place to start! This is a Aussie hair care slogan and it’s so true. As I have mentioned in previous posts, over the last few months I have taken to straightening my hair. This is because its so dry that it doesnt sit straight (and it is wavy too) – not sure why my lightbulb told me to straighten it because this is just making the problem worse in the long run! I was using serum to protect it before and afterwards, until I had a conversation with my hairdresser. She told me not to use it before straightening unless it has heat defense in it because its just oil and will fry the hair. So the very thing I thought was protecting my hair was probably destroying it. Ironically, I had been using the Frizezze product but changed to a Tony and Guy one, and it was only the previous product that had heat defense. When I mentioned this issue – needing to find a good heat defense product – to friends on Facebook, one friend recommended the Aussie Take the Heat product. I’ve used the Aussie shampoo and conditioners and I certainly have no issues with those, so I thought I would give Take the Heat a go. The way I use it is this: after washing and conditioning my hair and getting excess water off with a towel, I will turn my head upside down and spray it liberally, concentrating on the ends. I probably use more than is recommended but better safe than sorry! I’ll then dry it if I am going out, or leave it to dry if I am not, and then straighten. The first thing I notice once it is dry is that it gives me more volume than I would otherwise be blessed with. And my hair feels silky. And looks silky too. These benefits are more than enough to justify the £4.99 price tag. When it comes to styling my hair with straighteners I have noticed that it takes more work than usual to get my hair looking sleek. It does what it says on the bottle – helps to smooth the hair – but the heat seems to take longer to penetrate the hair follicles. This is what we want, ultimately, of course – the product to protect the hair from heat damage, and so this can only be a good thing. I’ve been using this product a few weeks now and I have noticed a slight improvement in the quality of my hair, so its definitely worth using – and is a product I will be sticking with from here on in. P.s. Keep your eye on my blog for an up and coming competition to win two signed copies of works by the prominent children’s author, Inbali Iserles. I am a latecomer to dry shampoo. I don’t know, I just never liked the idea of it. It’s why I won’t buy a kindle – if it ain’t broke, don’t fix it. Paper books work fine, and so does traditional shampoo. The problem I have – and I don’t know if any of you will relate to this – I feel a need to wash my hair every day. If I don’t then my scalp feels dirty and I cannot relax. This is fine, it takes two minutes to wash my hair, but since developing ME its become more cumbersome. Recently I have taken to straightening my hair too because it looks much better but obviously the effects only last until my next wash. And given that straightening severely damages my hair I want to do this as little as possible. So that is when I decided to give in and try dry shampoo – with reports from my friends, I was expecting miracles. I remember as a kid reading in a magazine that talc in your hair was supposed to take the grease out. I also remember taking it and not thinking about the fact that talc is white and my hair is brunette! I had to field embarrassing questions all day about why I had talc powder in my hair! 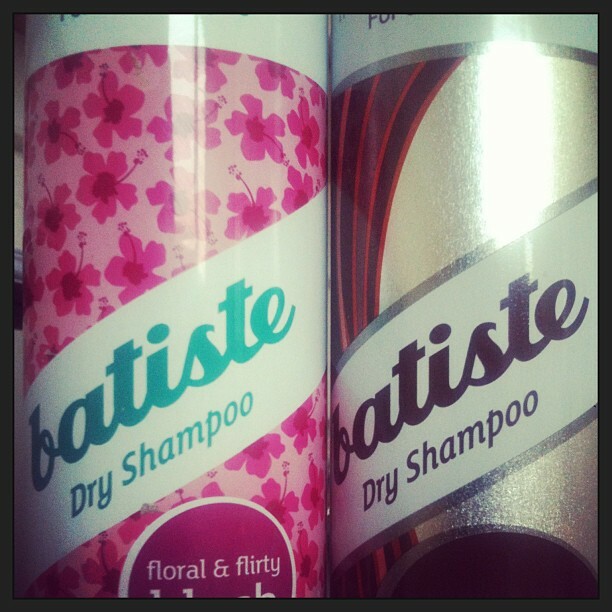 I was told to buy the top brand dry shampoo, and this is Batiste. I was assured it works well but is the only brand that does. So I headed down to Superdrug where I was pleased to see they had the product on offer. Not really knowing what I was looking at, I picked up a bottle – “Floral & Flirty Blush” – paid and went home. I hung my hair upside down and began to spray at the recommended distance of 30cm. The first thing I noticed was how refreshed my head felt! It really was like having a hair wash! But when I swung my head back up in the right direction I was taken right back to my ‘talc’ day at school – My roots were white! When I mentioned this to a friend she said you can get cans for brunettes so the next time I headed back and picked up one of those! I used the “a hint of colour – Dark & Deep Brown” the next time I did not want to wash my hair and it was much better. It still felt cool and it also didnt change my hair colour! Result! As the day wore on though I began to feel that dirty feeling so it did not really do what I was hoping for. And although it did brighten up my hair initially, it did look greasy by lunch time. I suppose it would have been a good idea to take the bottle out with me and apply as and when I needed to. I think this product is good for a quick pick-me-up but I wouldnt use it in place of a good shampoo. I havent really used it since – my son gets some use out of it though – but I wouldnt rule it out, and its certainly good to have some in the cupboard for emergencies.